FSH stands for follicle-stimulating hormone and is partially responsible for causing the ovaries to ovulate each month. High FSH is, according to current medical dogma, a sign of “infertility.” The younger the woman diagnosed with a high FSH, the more of a enigma this diagnosis becomes. Quite often, younger women who start out their baby journey with a diagnosis of unexplained infertility, after several rounds of ovarian stimulating hormones find themselves facing escalating FSH levels. This brief Remembering Your Spirit Segment of The Oprah Winfrey Show is a beautiful short video of Julia Indichova’s story of being diagnosed with an FSH of 42 at the age of 42, the diagnosis that launched her life’s work as a fertility educator and activist. Julia shares her story in order to give other women who have been diagnosed with high FSH hope. 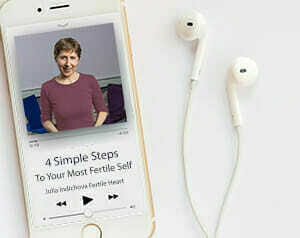 Finding out she had high FSH over the age of 40 put the cogs in motion to research the fertility treatments, foods, supplements, and later give birth to the Fertile Heart Ovum Program which has helped so many women beat the odds not only with high FSH, but after recurrent miscarriages, PCOS, endometriosis and other medical challenges.